The problem states that the system is at equilibrium, so we simply substitute the equilibrium concentrations into the equilibrium expression to calculate Kc. Step 1: Calculate the concentrations of the components in units of mol/L. The molarities can be calculated by simply dividing the number of moles by the volume of the flask. Step 2: Once the molarities are known, Kc can be found by substituting the molarities into the equilibrium expression. If you forget to convert moles to moles/liter, will you get a different answer? Under what circumstances will the two answers be the same? Using the mole amounts and volume given in the problem, we calculate the concentrations of H2 and CH3OH. With Kc = 10, products are favored at equilibrium. Because the coefficients for both A and B are one, we expect the concentration of B to be 10 times that of A at equilibrium. Diagram (a) is the best choice with 10 B molecules and 1 A molecule. With Kc = 0.10, reactants are favored at equilibrium. Because the coefficients for both A and B are one, we expect the concentration of A to be 10 times that of B at equilibrium. Diagram (d) is the best choice with 10 A molecules and 1 B molecule. You can calculate Kc in each case without knowing the volume of the container because the mole ratio between A and B is the same. Volume will cancel from the Kc expression. Only moles of each component are needed to calculate Kc. Note that we are comparing similar reactions at equilibrium – two reactants producing one product, all with coefficients of one in the balanced equation. The reaction, A + C AC has the largest equilibrium constant. Of the three diagrams, there is the most product present at equilibrium. The reaction, A + D AD has the smallest equilibrium constant. Of the three diagrams, there is the least amount of product present at equilibrium. When the equation for a reversible reaction is written in the opposite direction, the equilibrium constant becomes the reciprocal of the original equilibrium constant. What unit of temperature should we use? The relationship between Kc and KP is given by Equation 15.4 of the text. Rearrange the equation relating KP and Kc, solving for Kc. We can write the equilibrium expression from the balanced equation and substitute in the pressures. Do we need to know the temperature? Is there a relationship between the Kc values from parts (a) and (b)? KP can be found as shown below. Because pure solids do not enter into an equilibrium expression, we can calculate KP directly from the pressure that is due solely to CO2(g). Now, we can convert KP to Kc using the following equation. We substitute the given pressures into the reaction quotient expression. The calculated value of QP is less than KP for this system. The system will change in a way to increase QP until it is equal to KP. To achieve this, the pressures of PCl3 and Cl2 must increase, and the pressure of PCl5 must decrease. Could you actually determine the final pressure of each gas? Because they are constant quantities, the concentrations of solids and liquids do not appear in the equilibrium expressions for heterogeneous systems. The total pressure at equilibrium that is given is due to both NH3 and CO2. Note that for every 1 atm of CO2 produced, 2 atm of NH3 will be produced due to the stoichiometry of the balanced equation. Using this ratio, we can calculate the partial pressures of NH3 and CO2 at equilibrium. The total pressure in the flask (0.363 atm) is a sum of the partial pressures of NH3 and CO2. Substitute the equilibrium pressures into the equilibrium expression to solve for KP. If the CO pressure at equilibrium is 0.497 atm, the balanced equation requires the chlorine pressure to have the same value. The initial pressure of phosgene gas can be found from the ideal gas equation. The value of KP is then found by substitution. Let x be the initial pressure of NOBr. Using the balanced equation, we can write expressions for the partial pressures at equilibrium. The sum of these is the total pressure. We find KP by substitution. The target equation is the sum of the first two. What happens in the special case when the two component reactions are the same? Can you generalize this relationship to adding more than two reactions? What happens if one takes the difference between two reactions? Now we can add the above equation to the second equation to obtain the final equation. Since we add the two equations, the equilibrium constant is the product of the equilibrium constants for the two reactions. Use the law of mass action to write the equilibrium expression. The equilibrium expression must yield Kc = 2 for the reaction to be at equilibrium. The equilibrium expression has the form of concentrations of products over concentrations of reactants, each raised to the appropriate power. Plug in the concentrations of all three species to evaluate Kc. Since Kc = 2, diagrams (a), (b), and (c) represent and equilibrium mixture of A2, B2, and AB. Use the law of mass action to write the equilibrium expression. The mixtures at equilibrium will have the same Kc value. For diagrams (a), (c), and (d), Kc = 3. Therefore, diagram (b) is not at equilibrium. The equilibrium constant Kc is given, and we start with a mixture of CO and H2O. From the stoichiometry of the reaction, we can determine the concentration of H2 at equilibrium. Knowing the partial pressure of H2 and the volume of the container, we can calculate the number of moles of H2. The balanced equation shows that one mole of water will combine with one mole of carbon monoxide to form one mole of hydrogen and one mole of carbon dioxide. (This is the reverse reaction.) Let x be the depletion in the concentration of either CO or H2O at equilibrium (why can x serve to represent either quantity?). The equilibrium concentration of hydrogen must then also be equal to x. The changes are summarized as shown in the table. Since the reaction started with only pure NO2, the equilibrium concentration of NO must be twice the equilibrium concentration of O2, due to the 2:1 mole ratio of the balanced equation. Therefore, the equilibrium partial pressure of NO is (2 ´ 0.25 atm) = 0.50 atm. We can find the equilibrium NO2 pressure by rearranging the equilibrium expression, then substituting in the known values. Notice that the balanced equation requires that for every two moles of HBr consumed, one mole of H2 and one mole of Br2 must be formed. Let 2x be the depletion in the concentration of HBr at equilibrium. The equilibrium concentrations of H2 and Br2 must therefore each be x. The changes are shown in the table. If the depletion in the concentration of HBr at equilibrium were defined as x, rather than 2x, what would be the appropriate expressions for the equilibrium concentrations of H2 and Br2? Should the final answers be different in this case? We follow the procedure outlined in Section 15.4 of the text to calculate the equilibrium concentrations. Step 2: Write the equilibrium expression in terms of the equilibrium concentrations. Knowing the value of the equilibrium constant, solve for x. The second solution is physically impossible because you cannot have a negative concentration. The first solution is the correct answer. Step 3: Having solved for x, calculate the equilibrium concentrations of all species. We could have simplified this problem by assuming that x was small compared to 0.0198. We could then assume that 0.0198 - x » 0.0198. By making this assumption, we could have avoided solving a quadratic equation. Since equilibrium pressures are desired, we calculate KP. The equilibrium constant, Kc, can be found by simple substitution. The value of Qc is smaller than Kc; therefore, the system will shift to the right, increasing the concentrations of CO and H2O and decreasing the concentrations of CO2 and H2. Let x be the depletion in the concentration of CO2 at equilibrium. The stoichiometry of the balanced equation then requires that the decrease in the concentration of H2 must also be x, and that the concentration increases of CO and H2O be equal to x as well. The changes in the original concentrations are shown in the table. The positive root of the equation is x = 0.025. The initial concentrations are [H2] = 0.80 mol/5.0 L = 0.16 M and [CO2] = 0.80 mol/5.0 L = 0.16 M.
We are given the concentrations of all species in a biochemical reaction and must determine whether the reaction will proceed in the forward direction or the reverse direction in order to establish equilibrium. This requires calculating the value of Q and comparing it to the value of K, which is given in the problem. Because K is 1.11, Q is greater than K. Thus, the reaction will proceed to the left (the reverse reaction will occur) in order to establish equilibrium. The forward reaction will not occur. According to Le Châtelier's principle, increasing the temperature of an equilibrium mixture causes a shift toward the product side (to the right) for an endothermic reaction, and a shift toward the reactant side (to the left) for an exothermic reaction. Reactions where ∆H is negative are exothermic. Equilibria (a), (d), and (e) are exothermic and will shift to the left when the temperature is increased. According to Le Châtelier's principle, increasing the volume causes a shift toward the side with the larger number of moles of gas. Decreasing the volume of an equilibrium mixture causes a shift toward the side of the equation with the smaller number of moles of gas. For an equilibrium with equal numbers of gaseous moles on both sides, a change in volume does not cause the equilibrium to shift in either direction. Determine the numbers of moles of gas in both the reactants and products for each reaction. There are an equal number of moles of gas in the reactants and products for reaction (b). A change in volume will not affect the position of its equilibrium. According to Le Châtelier's principle, adding a reactant to an equilibrium mixture shifts the equilibrium toward the product side (to the right) of the equation. Only equilibria containing H2 as a reactant will shift to the right when H2 is added. Equilibria (a) and (c) contain H2 as a reactant and will shift to the right when more H2 is added. Use Le Châtelier's principle to determine which of the following scenarios will cause the reaction equilibrium to shift to the right. Decreasing the volume of an equilibrium mixture causes a shift toward the side of the equation with the smaller number of moles of gas. The equilibrium will shift to the left. Increasing the volume of an equilibrium mixture causes a shift toward the side with the larger number of moles of gas. The equilibrium will shift to the right. Altering the amount of a solid does not change the position of the equilibrium because doing so does not change the value of Q. The addition of more reactant will shift the equilibrium to the right. The removal of a product will shift the equilibrium to the right. (b), (d), and (e) will cause the equilibrium to shift to the right. Addition of more Cl2(g) (a reactant): The equilibrium would shift to the right. Removal of SO2Cl2(g) (a product): The equilibrium would shift to the right. Removal of SO2(g) (a reactant): The equilibrium would shift to the left. Removal of CO2(g) from the system: The equilibrium would shift to the right. Addition of more solid Na2CO3: The equilibrium would be unaffected. [Na2CO3] does not appear in the equilibrium expression. Removal of some of the solid NaHCO3: The equilibrium would be unaffected. Same reason as (b). This reaction is endothermic. (Why?) According to Section 15.5, an increase in temperature favors an endothermic reaction, so the equilibrium constant should become larger. This reaction is exothermic. Such reactions are favored by decreases in temperature. The magnitude of Kc should decrease. In this system heat is neither absorbed nor released. A change in temperature should have no effect on the magnitude of the equilibrium constant. A change in pressure can affect only the volume of a gas, but not that of a solid or liquid because solids and liquids are much less compressible. The stress applied is an increase in pressure. According to Le Châtelier's principle, the system will adjust to partially offset this stress. In other words, the system will adjust to decrease the pressure. This can be achieved by shifting to the side of the equation that has fewer moles of gas. Recall that pressure is directly proportional to moles of gas: PV = nRT so P µ n.
Changes in pressure ordinarily do not affect the concentrations of reacting species in condensed phases because liquids and solids are virtually incompressible. Pressure change should have no effect on this system. No effect. Same situation as (a). In this equation there are equal moles of gaseous reactants and products. A shift in either direction will have no effect on the total number of moles of gas present. There will be no effect on the position of the equilibrium when the pressure is increased. A shift in the direction of the reverse reaction (shift to the left) will have the result of decreasing the total number of moles of gas present. A pressure increase will favor the reaction (forward or reverse?) that decreases the total number of moles of gas. The equilibrium should shift to the right, i.e., more I2 will be produced at the expense of I. Increasing the concentration of I2 will increase Qc. The equilibrium will be reestablished in such a way that Qc is again equal to the equilibrium constant. More I will form. The system shifts to the left to establish equilibrium. The forward reaction is exothermic. A decease in temperature will shift the system to the right to reestablish equilibrium. adjust to partially offset the stress? (d) The stress is an increase in pressure. The system will adjust to decrease the pressure. Remember, pressure is directly proportional to moles of gas. The stress applied is the heat added to the system. Note that the reaction is endothermic (DH° > 0). Endothermic reactions absorb heat from the surroundings; therefore, we can think of heat as a reactant. The stress is the addition of Cl2 gas. The system will shift in the direction to remove some of the added Cl2. The system shifts to the left until equilibrium is reestablished. that was removed. The system shifts to the right until equilibrium is reestablished. The stress applied is an increase in pressure. The system will adjust to remove the stress by decreasing the pressure. Recall that pressure is directly proportional to the number of moles of gas. In the balanced equation we see 1 mole of gas on the reactants side and 2 moles of gas on the products side. The pressure can be decreased by shifting to the side with the fewer moles of gas. The system will shift to the left to reestablish equilibrium. The function of a catalyst is to increase the rate of a reaction. If a catalyst is added to the reacting system not at equilibrium, the system will reach equilibrium faster than if left undisturbed. If a system is already at equilibrium, as in this case, the addition of a catalyst will not affect either the concentrations of reactant and product, or the equilibrium constant. A catalyst has no effect on equilibrium position. Increasing the temperature favors the endothermic reaction so that the concentrations of SO2 and O2 will increase while that of SO3 will decrease. Increasing the pressure favors the reaction that decreases the number of moles of gas. The concentration of SO3 will increase. Increasing the concentration of SO2 will lead to an increase in the concentration of SO3 and a decrease in the concentration of O2. A catalyst has no effect on the position of equilibrium. Adding an inert gas at constant volume has no effect on the position of equilibrium. No change. A catalyst has no effect on the position of the equilibrium. If helium gas is added to the system without changing the pressure or the temperature, the volume of the container must necessarily be increased. This will decrease the partial pressures of all the reactants and products. A pressure decrease will favor the reaction that increases the number of moles of gas. The position of equilibrium will shift to the left. If the volume remains unchanged, the partial pressures of all the reactants and products will remain the same. The reaction quotient Qc will still equal the equilibrium constant, and there will be no change in the position of equilibrium. This means that to remain at equilibrium, the pressure of carbon dioxide must stay at a fixed value as long as the temperature remains the same. Assuming that the amount of added solid CaO is not so large that the volume of the system is altered significantly, there should be no effect. If a huge amount of CaO were added, this would have the effect of reducing the volume of the container. What would happen then? Assuming that the amount of CaCO3 removed doesn't alter the container volume significantly, there should be no effect. Removing a huge amount of CaCO3 will have the effect of increasing the container volume. The result in that case will be the same as in part (a). Carbon dioxide does not react with hydrochloric acid, but CaCO3 does. The CO2 produced by the action of the acid will combine with CaO as discussed in (d) above. 2O3(g) 3O2(g) DH = -284.4 kJ/mol. Equilibrium would shift to the left. The number of O3 molecules would increase and the number of O2 molecules would decrease. Use Le Châtelier's principle to predict the direction of shift for each case. A shift to the left will cause a decrease in the amount of HbO2 and a shift to the right will cause an increase in the amount of HbO2. Decreasing the temperature of an equilibrium mixture causes a shift toward the product side for an exothermic reaction (∆H < 0). The equilibrium will shift to the right and increase the amount of HbO2. According to Henry’s Law (Equation 13.3), the solubility of a gas in a liquid is proportional to the pressure of the gas over the solution. Increasing the pressure of O2 would increase its concentration. The equilibrium would shift to the right and increase the amount of HbO2. The removal of a reactant will shift the equilibrium to the left. The amount of HbO2 will decrease. According to Le Châtelier's principle, adding a product to an equilibrium mixture shifts the equilibrium toward the reactant side (to the left) of the equation. The addition of acid (product) will shift the equilibrium to the left. As a result, the concentration of oxyhemoglobin will decrease as acidosis occurs. We set up a table for the calculated values of Kc and KP. Since Kc (and KP) decrease with temperature, the reaction is exothermic. A mixture of H2 and O2 can be kept at room temperature because of a very large activation energy. The reaction of hydrogen with oxygen is infinitely slow without a catalyst or an initiator. The action of a single spark on a mixture of these gases results in the explosive formation of water. Using data from Appendix 2 we calculate the enthalpy change for the reaction. The enthalpy change is negative, so the reaction is exothermic. The formation of NOCl will be favored by low temperature. A pressure increase favors the reaction forming fewer moles of gas. The formation of NOCl will be favored by high pressure. Calculate the value of KP by substituting the equilibrium partial pressures into the equilibrium expression. Check that substituting these equilibrium concentrations into the equilibrium expression gives the equilibrium constant calculated in part (a). We find the number of moles of ammonia (or hydrogen sulfide) and ammonium hydrogen sulfide. You can calculate the partial pressure of each gaseous component from the mole fraction and the total pressure. Calculate KP by substituting the partial pressures into the equilibrium expression. The total pressure is the sum of the ammonia and carbon dioxide pressures. Set up a table that contains the initial concentrations, the change in concentrations, and the equilibrium concentration. Assume that the vessel has a volume of 1 L.
Dn = 0, Kc = KP. Since we assumed that the vessel had a volume of 1 L, the above molarities also correspond to the number of moles of each component. From the mole fraction of each component and the total pressure, we can calculate the partial pressure of each component. Set up a table that contains the initial concentrations, the change in concentrations, and the equilibrium concentrations. The initial concentration of I2(g) is 0.054 mol/0.48 L = 0.1125 M. The amount of I2 that dissociates is (0.0252)(0.1125 M) = 0.002835 M. We carry extra significant figures throughout this calculation to minimize rounding errors. Substitute the equilibrium concentrations into the equilibrium expression to solve for Kc. This is a difficult problem. Express the equilibrium number of moles in terms of the initial moles and the change in number of moles (x). Next, calculate the mole fraction of each component. Using the mole fraction, you should come up with a relationship between partial pressure and total pressure for each component. Substitute the partial pressures into the equilibrium expression to solve for the total pressure, PT. Substituting x into the following mole fraction equations, the mole fractions of N2 and H2 can be calculated. The partial pressures of each component are equal to the mole fraction multiplied by the total pressure. Substitute the partial pressures above (in terms of PT) into the equilibrium expression, and solve for PT. Substitute the equilibrium concentrations into the equilibrium expression to calculate Kc. The reaction is endothermic because A—B bonds are broken and no new bonds form. Therefore, when temperature is decreased, the equilibrium will shift to the left causing more AB to form. Equilibrium will shift to the right (toward the larger number of gaseous moles). Adding He will have no effect on the position of the equilibrium. Adding a catalyst will have no effect on the position of the equilibrium. For a 100% yield, 2.00 moles of SO3 would be formed (why?). An 80% yield means 2.00 moles ´ (0.80)  1.60 moles SO3 is formed. We carry an additional significant figure throughout this calculation to minimize rounding errors. We construct a table to determine how much I2 has dissociated. Panting decreases the concentration of CO2 because CO2 is exhaled during respiration. This decreases the concentration of carbonate ions, shifting the equilibrium to the left. Less CaCO3 is produced. Two possible solutions would be either to cool the chickens' environment or to feed them carbonated water. According to the ideal gas law, pressure is directly proportional to the concentration of a gas in mol/L if the reaction is at constant volume and temperature. Therefore, pressure may be used as a concentration unit. Was the assumption valid that we made above? Typically, the assumption is considered valid if x is less than 5 percent of the number that we said it was very small compared to. Is this the case? The sum of the mole fractions must equal one. According to the hint, the average molar mass is the sum of the products of the mole fraction of each gas and its molar mass. If you started with radioactive iodine in the solid phase, then you should fine radioactive iodine in the vapor phase at equilibrium. Conversely, if you started with radioactive iodine in the vapor phase, you should find radioactive iodine in the solid phase. Both of these observations indicate a dynamic equilibrium between solid and vapor phase. From the ideal gas equation, we can calculate the moles of O2 produced by the decomposition of CuO. If the number of moles of CuO were less than 0.037 mol, the equilibrium could not be established because the pressure of O2 would be less than 0.49 atm. Therefore, the smallest number of moles of CuO needed to establish equilibrium must be slightly greater than 0.037 mol. If there were 0.88 mole of CO2 initially and at equilibrium there were 0.11 moles, then (0.88 - 0.11) moles = 0.77 moles reacted. In the balanced equation there are equal number of moles of products and reactants; therefore, the volume of the container will not affect the calculation of Kc. We can solve for the equilibrium constant in terms of moles. We first must find the initial concentrations of all the species in the system. Calculate the reaction quotient by substituting the initial concentrations into the appropriate equation. We find that Qc is less than Kc. The equilibrium will shift to the right, decreasing the concentrations of H2 and I2 and increasing the concentration of HI. We set up the usual table. Let x be the decrease in concentration of H2 and I2. Having solved for x, calculate the equilibrium concentrations. Since we started with pure A, then any A that is lost forms equal amounts of B and C. Since the total pressure is P, the pressure of B + C = P - 0.14 P = 0.86 P. The pressure of B = C = 0.43 P.
The gas cannot be (a) because the color became lighter with heating. Heating (a) to 150°C would produce some HBr, which is colorless and would lighten rather than darken the gas. The gas cannot be (b) because Br2 doesn't dissociate into Br atoms at 150°C, so the color shouldn't change. An increase in pressure shifts the equilibrium back to the left, restoring the color by producing NO2. As ionic size decreases, charge density increases. Thus, Ba2+ has the lowest charge density and Mg2+ has the highest charge density. The higher the charge density, the greater the Coulombic attraction between cation and anion. Temperature must have units of Kelvin. Since KP increases with temperature, it is endothermic. Lightening. The electrical energy promotes the endothermic reaction. The vapor pressure of water is equivalent to saying the partial pressure of H2O(g). Potassium is more volatile than sodium. Therefore, its removal shifts the equilibrium from left to right. We can calculate the average molar mass of the gaseous mixture from the density. The average molar mass is equal to the sum of the molar masses of each component times the respective mole fractions. Setting this up, we can calculate the mole fraction of each component. We can now calculate the partial pressure of NO2 from the mole fraction and the total pressure. We can calculate the partial pressure of N2O4 by difference. Finally, we can calculate KP for the dissociation of N2O4. In this problem, you are asked to calculate Kc. Step 1: Calculate the initial concentration of NOCl. We carry an extra significant figure throughout this calculation to minimize rounding errors. Step 3: The equilibrium constant Kc can be calculated by substituting the above concentrations into the equilibrium expression. Since both reactions are endothermic (DH° is positive), according to Le Châtelier’s principle the products would be favored at high temperatures. Indeed, the steam-reforming process is carried out at very high temperatures (between 800°C and 1000°C). It is interesting to note that in a plant that uses natural gas (methane) for both hydrogen generation and heating, about one-third of the gas is burned to maintain the high temperatures. In each reaction there are more moles of products than reactants; therefore, we expect products to be favored at low pressures. In reality, the reactions are carried out at high pressures. The reason is that when the hydrogen gas produced is used captively (usually in the synthesis of ammonia), high pressure leads to higher yields of ammonia. Assuming the self-ionization of water occurs by a single elementary step mechanism, the equilibrium constant is just the ratio of the forward and reverse rate constants. We assume the concentration of hydrogen ion and hydroxide ion are equal. At equilibrium, the value of Kc is equal to the ratio of the forward rate constant to the rate constant for the reverse reaction. Volume is doubled so pressure is halved. Let’s calculate QP and compare it to KP. 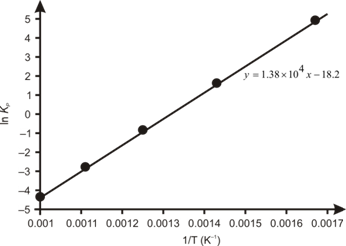 x = amount of N2O4 reacted. Substitute into the KP expression to solve for x. Combine Ni with CO above 50°C. Pump away the Ni(CO)4 vapor (shift equilibrium to right), leaving the solid impurities behind. The decomposition is endothermic, which is favored at high temperatures. Heat Ni(CO)4 above 200°C to convert it back to Ni. Yes. This concentration exceeds the safety limit of 0.05 mg/m3. Initially, at equilibrium: [NO2] = 0.0475 M and [N2O4] = 0.487 M. At the instant the volume is halved, the concentrations double. As we can see, the new equilibrium concentration of NO2 is greater than the initial equilibrium concentration (0.0475 M). Therefore, the gases should look darker! There is a temporary dynamic equilibrium between the melting ice cubes and the freezing of water between the ice cubes. A catalyst speeds up the rates of the forward and reverse reactions to the same extent. A catalyst would not change the energies of the reactant and product. The first reaction is exothermic. Raising the temperature would favor the reverse reaction, increasing the amount of reactant and decreasing the amount of product at equilibrium. The equilibrium constant, K, would decrease. The second reaction is endothermic. Raising the temperature would favor the forward reaction, increasing the amount of product and decreasing the amount of reactant at equilibrium. The equilibrium constant, K, would increase. A catalyst lowers the activation energy for the forward and reverse reactions to the same extent. Adding a catalyst to a reaction mixture will simply cause the mixture to reach equilibrium sooner. The same equilibrium mixture could be obtained without the catalyst, but we might have to wait longer for equilibrium to be reached. If the same equilibrium position is reached, with or without a catalyst, then the equilibrium constant is the same. First, let's calculate the initial concentration of ammonia. Let's set up a table to represent the equilibrium concentrations. We represent the amount of NH3 that reacts as 2x. Substitute into the equilibrium expression to solve for x. To determine DH°, we need to plot ln KP versus 1/T (y vs. x). The slope of the plot equals -DH°/R. KP is a constant (at constant temperature). If P increases, the fraction (and therefore x) must decrease. Equilibrium shifts to the left to produce less NO2 and more N2O4 as predicted. We start by writing the van’t Hoff equation at two different temperatures. Assuming an endothermic reaction, DH° > 0 and T2 > T1. Then, < 0, meaning that < 0 or K1 < K2. A larger K2 indicates that there are more products at equilibrium as the temperature is raised. This agrees with LeChatelier’s principle that an increase in temperature favors the forward endothermic reaction. The opposite of the above discussion holds for an exothermic reaction. H2O(l) H2O(g) DHvap = ? as a heterogeneous equilibrium, . We substitute into the equation derived in part (a) to solve for DHvap. Initially, the pressure of SO2Cl2 is 9.00 atm. The pressure is held constant, so after the reaction reaches equilibrium, . The amount (pressure) of SO2Cl2 reacted must equal the pressure of SO2 and Cl2 produced for the pressure to remain constant. If we let , then the pressure of SO2Cl2 reacted must be 2x. We set up a table showing the initial pressures, the change in pressures, and the equilibrium pressures. Again, note that the change in pressure for SO2Cl2 (-2x) does not match the stoichiometry of the reaction, because we are expressing changes in pressure. The total pressure is kept at 9.00 atm throughout. Using Equation 14.8 of the text, we can calculate k-1. We start with a table. We write two different equilibrium constants expressions for the two tables. We equate the equilibrium expressions and solve for x. We substitute x back into one of the equilibrium expressions to solve for K.
Substitute x into the other equilibrium expression to see if you obtain the same value for K. Note that we used moles rather than molarity for the concentrations, because the volume, V, cancels in the equilibrium expressions. First, we calculate the moles of I2. Let x be the number of moles of I2 that dissolves in CCl4, so (1.26 × 10-4 - x)mol remains dissolved in water. We set up expressions for the concentrations of I2 in CCl4 and H2O. Next, we substitute these concentrations into the equilibrium expression and solve for x. The first extraction leaves only 7% I2 in the water. The next extraction with 0.030 L of CCl4 will leave only (0.07)(0.07) = 5 × 10-3. This is the fraction remaining after the second extraction which is only 0.5%. The concentration of I2 is the same as in part (a). The concentrations of solids and pure liquids do not appear in KC. So, even though the given equilibrium is heterogeneous, Equation 15.4 still applies. Dn = 3 – 6 = –3. According to Le Châtelier’s principle, an exothermic equilibrium can be shifted to the right by lowering the temperature. Also, raising the pressure will favor the production of product since the equilibrium will respond to this stress by minimizing the number of gas particles. From the standpoint of optimizing the yield, temperature should be low and pressure should be high. To optimize the rate of production, both the forward and reverse reactions should be very rapid to ensure that equilibrium is established quickly. From a kinetic standpoint, temperature and pressure (concentration) should both be high. So, look for reactions that show no change in the number of gas molecules as the reaction occurs. Also, note that Equation 15.4 does not apply to heterogeneous equilibria if liquid phases are solutions. Equation 15.4 is not applicable (some species are aqueous). Use the law of mass action to write the equilibrium expression. The equilibrium expression has the form of the concentrations of products over the concentration of reactants, each raised to a power equal to its stoichiometric coefficient in the balanced chemical equation. To evaluate Kc, plug in the equilibrium concentrations of all three species into the equilibrium expression derived in part ‘a’. Begin by writing the equilibrium expression for the precipitation reaction. Take the sum of the two reactions and write the net reaction. The overall equilibrium constant is the product of the individual constants. Use the concentrations provided to calculate Qc, and then compare Qc with Kc. The calculated value of Qc is greater than Kc. Therefore, the reaction is not at equilibrium and must proceed to the left to establish equilibrium. Construct an equilibrium table to determine the equilibrium concentration of each species in terms of an unknown (x); solve for x, and use it to calculate the equilibrium molar concentrations. Next, we insert these expressions for the equilibrium concentrations into the equilibrium expression and solve for x.